UNT's diverse environment, learning opportunities give students an edge as they map their success across the continents. UNT blazes path, propelled by imagination and knowledge. The English literature graduate serves as editor-in-chief of Texas Monthly. Members of the Class of 1964 reminisce about their college days. Mean Green victory lights are now shining brighter and more efficiently in the McConnell Tower. UNT alumnus Marius Necsoiu searches for clues about climate change. The Rev. Kyev Tatum says he found his purpose with the help of mentors. UNT alumni from around the world came to honor Professor Emeritus G. Roland Vela. UNT marketing alums' growing forklift company racks up industry and business awards. UNT's first comprehensive campaign impacts academic programs and students. Members of a club in the 1960s changed the music world. Students can use 3D scanners and printers and Google glass in UNT Libraries' newest resource. How can you reinvent yourself for the new year? UNT alumna Anila Quayyum Agha wins prestigious ArtPrize 2014. UNT alumnus Bill R. Neale leaves mark in art, advertising fields. Donation honors late UNT College of Music student and percussionist. 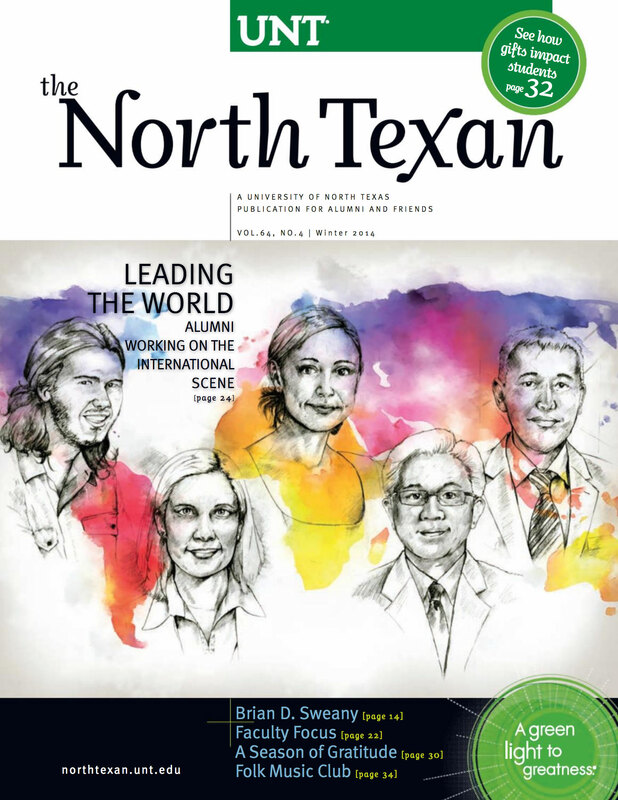 See what life at UNT sounds like and how we work together in harmony. UNT alumnus Mark Dostert turns experience as jail guard into book. UNT's Child Development Lab molds pre-schoolers, future teachers. 'Mean' Joe Greene, C-USA honors, basketball. UNT alumna Latonia Moore finds ultimate experience in opera. Members of the UNT Alumni Association have many ways to keep in touch with each other. UNT and the Consulate General of Mexico in Dallas create education information center. Alumni share their favorite "foodie memories" from UNT. Science meets art, sharpening North Texas high school math skills and winning investors. Watch a video to learn more about how gifts to UNT had impacted students.